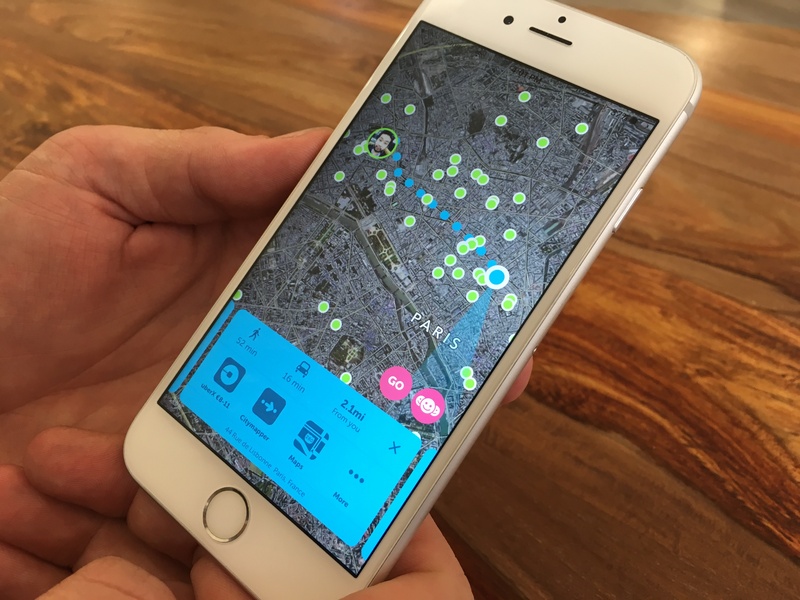 Now that you are giving up on check-ins and sharing your location with your friends, a French startup is coming up with better technology and new use cases to make location cool again. Zenly has been quietly working on location for years, and teenagers are now getting addicted to this app. SoLoMo is back. Zenly couldn’t be more straightforward. When you open the app, you see a giant map with your location and your friends’ location. You can tap on a friend’s picture and see exactly where they are. Or you can just aimlessly swipe through your friends and jump around the map. This is Zenly’s core feature. When I first heard about this pitch, I wasn’t convinced by the idea. What if you could share your location with your close friends and family? This question doesn’t sound compelling at all. It sounds a lot like Apple’s Find My Friends, a bit like Foursquare, and it’s also very reminiscent of dozens of failed startups (R.I.P. Sam Altman’s Loopt, Gowalla, BrightKite, Highlight…). And I’ve also never been a fan of constant location sharing. First, I care about my privacy. Second, background location apps kill my phone’s battery. Third, why would I even use something like this anyway? But I gave it a serious shot and liked it a lot. Zenly is a well-designed, addictive app. I tend to open it every now and then just because it’s so different from everything out there. This isn’t another messaging app. This isn’t a social network. This isn’t a utility. It’s something that sits between all of these areas. And I keep opening the app. And it starts with the location technology. Zenly has a rock-solid, efficient yet accurate location algorithm. The app tries to figure out the exact address of your friends. In my experience, with a few exceptions, Zenly has been accurate and displayed my friends’ home addresses for example. At the same time, Zenly doesn’t kill your battery. I’ve been opening the app regularly, and yet it wasn’t even in the top 10 of biggest battery killers for the past 7 days — it has eaten up 3 percent of my battery. Behind the scene, Zenly tries to save as much battery as possible. For instance, the app doesn’t track your location when nobody wants to see it. If a friend opens the app, then Zenly will request your location. But during most of the day, Zenly doesn’t do much. And then, the app is full of little details that make it a polished experience. For instance, you can see the battery level of your friends. This could be useful if you’re wondering why someone isn’t answering your text messages, for instance. If you want to share your location with someone for just a few hours, you can send them a link so they can track you on a map in their browser. This could be useful if your friends don’t have Zenly or you’re just trying to meet up with someone who’s selling you a bike on Craigslist. But location sharing isn’t for everyone. I’m already comfortable with it given that I’ve been checking in on Foursquare and then Swarm for years. But many of my friends are still reluctant. You can choose to only share your current city with some of your friends. Or you can even temporarily hide your location for all of your friends or just some of them. But even with this kind of friction when it comes to privacy, Zenly has taken off for no apparent reason. The startup has been working on building a killer product before sharing it with the world. While the app has been available in the App Store and Play Store for a year and four months, the startup has acted more or less like a stealth startup. Yesterday, I went to the Zenly office and looked at the metrics dashboard. Zenly is about to hit 1 million registered users. There are now around 340,000 monthly active users and around 80,000 daily active users. And these numbers are growing rapidly. Not bad for a startup that hasn’t focused on growth yet. Who are these users? Teenagers. The app has been spreading around some high schools and middle schools like crazy. Some users add dozens of friends in just a few days. And they keep looking at what their friends have been doing, if they’re hanging out together, if there’s a party happening on Friday night. Maybe some of them have a crush on another Zenly user, while others are just bored. That’s why the company has recently raised an $11.2 million Series A round (€10 million) with Idinvest and Xavier Niel leading the round and other investors also participating, such as Kima Ventures, Solomon Hykes, Tony Jamous, Damien Morin, Edward Bouygues, Maxime Prades, Olivier Thomas, Romain Cottard and Bastien Cadeac. It’s clear now that Zenly has cracked the code of seamless location sharing technology. Now, there are two serious challenges ahead for the startup. Like other social apps, Zenly needs to become as sticky as possible for existing users. If you don’t open the app every other day, you’re going to forget about it. The startup has a few ideas on this front. Second, Zenly needs to find a way to keep growing so that it becomes a must-have. Having three friends on Zenly is cool. But having twenty friends makes it much more interesting. Now that Zenly has nailed down the core feature (location sharing), the startup can add social layers on top of it. Recently, the company added emojis, so you can ping your friends with symbols. For instance, I’ve been sending emojis to say that I’m on my way or that I’m running late. I’ve also used this feature to ping long-distance friends and say hi. And, let’s be honest, I’ve also used it as a joke to spam my friends with emojis. More obvious, you can tap the meet button and start an itinerary in Maps, Citymapper or Uber. If your friend is not that far, you can use Zenly as a compass. It could be useful if you got lost at a music festival for example. These are just some examples of social features that make sense when you combine them with a map. Zenly doesn’t want to become yet another messaging app, or yet another feed-based social network app. But there’s a lot of value in knowing your friends’ locations. Compared to other consumer apps, users don’t need to be actively posting every day on the app. Sharing your location is already interesting. And it could Zenly’s most interesting trick to foster user growth.